Join us for a sacred night under the stars of Springtime. 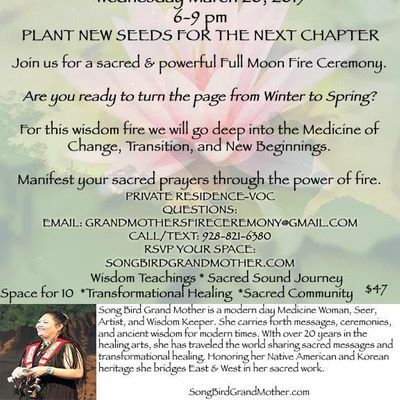 For tonight's fire, we will go deeper into the sacredness of transition, change, and birthing new seeds. Come and sit by the fire as the ancestors did, and release the darkness of Winter. Activate the ancient seeds within you and turn the chapter to a new beginning. 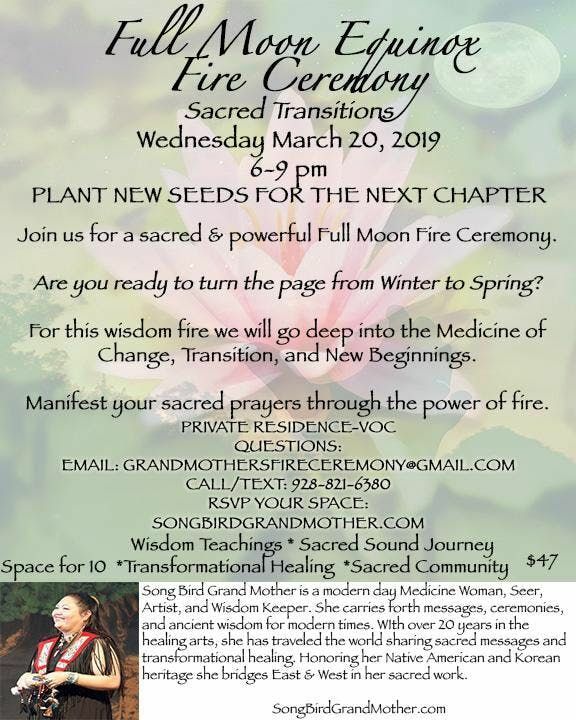 Ceremony is where the unmanifest becomes manifest, and during this sacred doorway, we are gifted the opportunity to magnify our prayers, intentions, and dreams with the full moon and equinox. For this precious gift, we will shift timelines, transmute lower frequencies, honor the ancestors, and birth new beginnings. Walk away shifted into your next chapter, and rejuvenate yourself with the power of the fire. No food so please come nourished. This is an outdoor fire, please bring blankets and dress warmly. If there is rain or snow we will move the fire indoors. Come prepared to be outside. The Address is given when your ticket is confirmed. It will arrive by email, so please look for it.